Formed in 1963 by New Zealander Bruce McLaren, McLaren Motor Racing has become a household name thanks to the continued presence and success in Formula 1. Bruce had begun his Formula 1 career as a driver, competing for Cooper alongside Jack Brabham. McLaren took the first of three Grand Prix wins for Cooper in 1959, as the youngest victor to that point at just 22, and finished second in the 1960 World Championship. 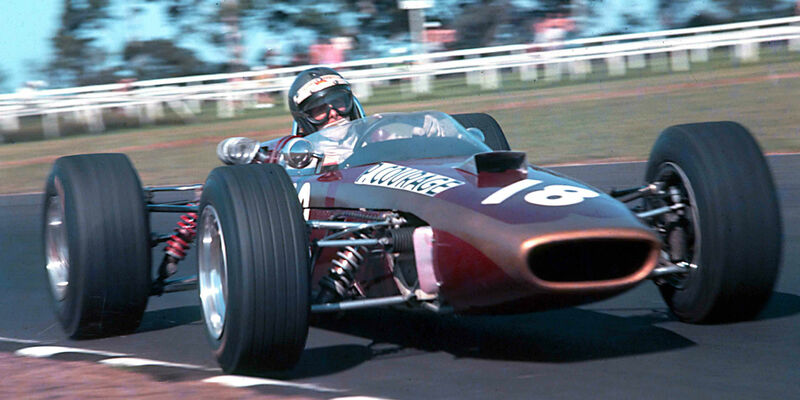 Bruce decided to start his own team in 1963 in time for the Tasman Series, while remaining a factory Cooper driver for Formula 1. Running a modified and lightened Cooper chassis with his own choice of 2.5-litre Coventry Climax engine, McLaren went on to win the series. 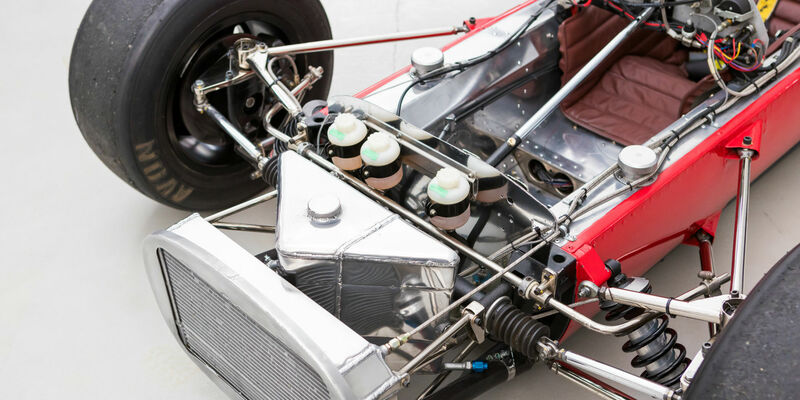 The first chassis design by McLaren was the M1 in 1963, a large capacity sports racing car contender which put the company on the map on either side of the Atlantic. Bruce McLaren and Chris Amon took victories aiding the order book, with Elva building 25 customer examples of the Mclaren-Elva M1A. Soon came the M1B, a development of the initial design which took on, and beat, the likes of Lola with their T70. 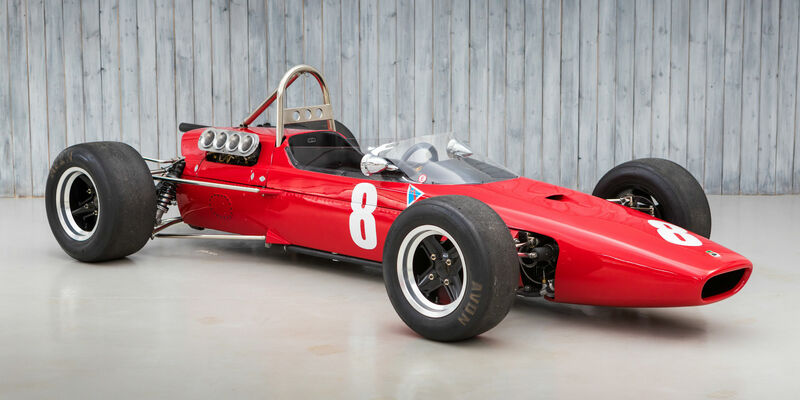 McLaren’s first single seater design came in the form of the M2A in 1965, a car which was described as a tyre test bed thanks to Bruce still being under contract with Cooper. After testing out designer Robin Herd’s ideas with the Mallite composite monocoque and 4.5-litre Oldsmobile V8 engine, McLaren refined the idea to create the M2B. 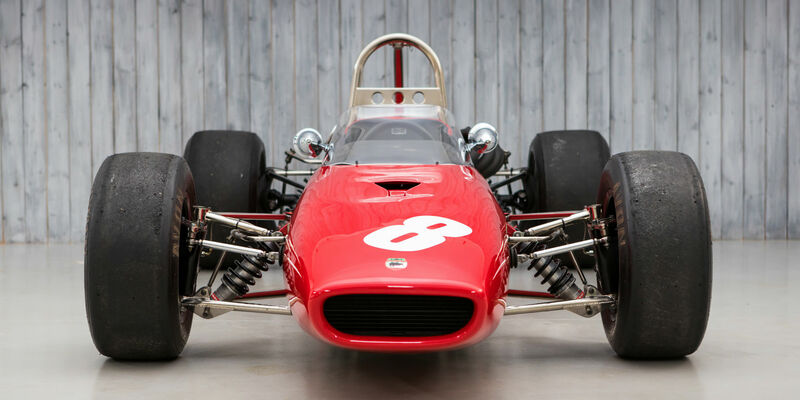 Retaining the use of the aerospace inspired Mallite in the construction, the M2B was powered by a 3.0-litre version of Ford’s V8 Indianapolis 500 engine, in line with the new capacity regulations of 1966 Formula 1. Bruce debuted the M2B at Monaco for the Grand Prix in 1966. 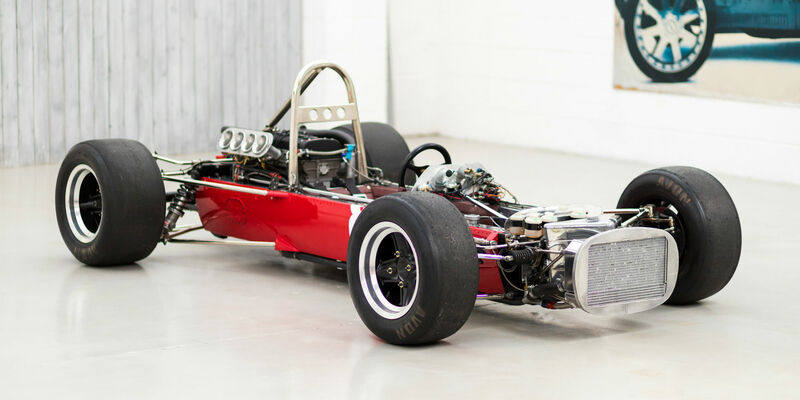 After a brief run of space frame M3 single seaters intended for Formula Libre and Hillclimb use, McLaren produced their first Formula 2 car, the M4. 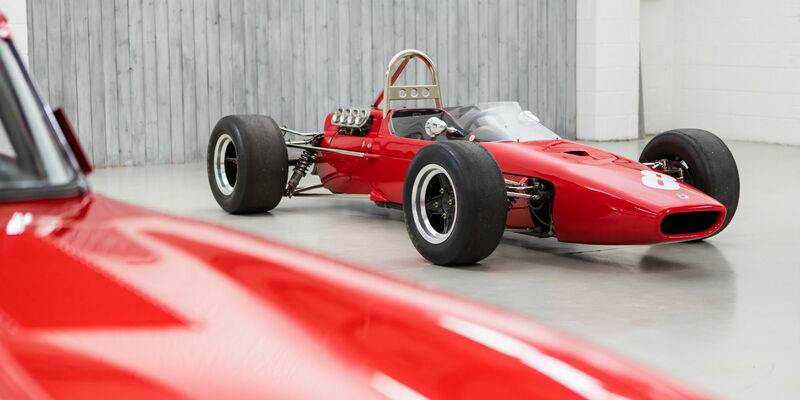 Using a full length aluminium monocoque chassis with Cosworth FVA power and Hewland FT200 gearbox, it debuted in 1967. 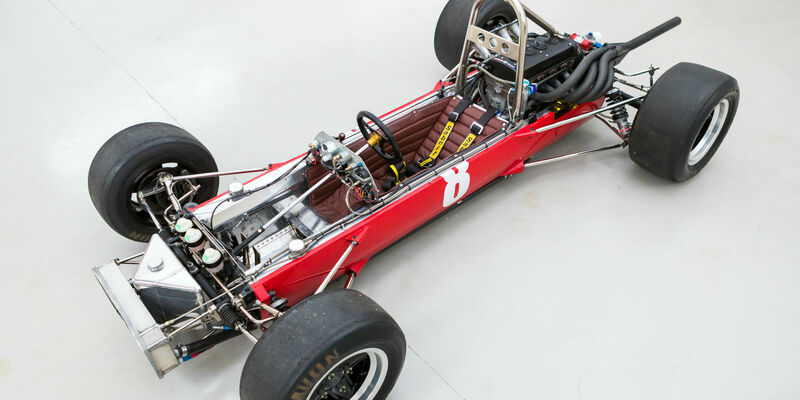 The model became known as the M4A when Bruce modified the design to accomodate a BRM V8 for Formula 1, christened the M4B. The first M4A chassis was kept in house and raced by Bruce himself, while the works McLaren team also fielded M4A/2, the car we have the pleasure of advertising today. M4A/2 became the most prominent of all the M4As, raced for owner John Coombs by the young star, Piers Courage. With Coombs’ previous driver Graham Hill now driving for Lotus, it was Courage, the heir to the Courage brewing dynasty, who made his debut in the M4A concurrently with his first Formula 1 outing with the works BRM team. Courage debuted M4A/2 at the first Formula 2 race of 1967, along with Bruce in M4A/1, at Snetterton in March for the Guards 100. Both of the McLaren run cars were turned out in bright red, and the team was aided by mechanic Howden Ganley who later drove for McLaren himself. With no customer M4As yet produced, Courage qualified on the fourth row, finishing 7th in Heat 1, while retiring from Heat 2. In the Final, he finished 7th after qualifying on the third row. Just a couple of weeks later, the works McLaren team were present at Silverstone for the B.A.R.C. 200. Once more, Courage qualified on the third row and finished 7th in the first of two heats after touching wheels with Denny Hulme. In the second, he was forced to retire with fuel injection woes. On the first weekend of April, Courage was present at the Grand Prix de Pau with M4A/2, but did not start the race after a mishap in qualifying. 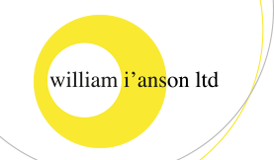 From Pau, the team were due to go on to Barcelona for the Gran Premio held on the parkland Montjuic circuit, but did not arrive due to M4A/2 not being repaired in time. By the time the Eifelrennen on the Nurburgring came around at the end of April, M4A/2 was back to racing condition once more, allowing Courage to qualify on the fifth row. The race was held in blizzard like conditions on the Sunday, and Courage came through to finish a fine 5th ahead of team leader Bruce in 6th. At Crystal Palace for the London Trophy in late May, Courage qualified M4A/2 on the third row for his heat, and went on to finish 3rd behind Jaussaud and McLaren. Starting again from row three in the final, Courage came through to finish 5th. A month later at the fast Reims circuit, Courage qualified poorly and retired from the race with engine woes. At Hockenheim on the first weekend of July, Courage qualified M4A/2 5th for the first of the two heats, and stepped onto the podium with a fine 3rd place finish. Starting from 3rd in the second heat, Courage ran in the lead bunch on the long fast track but spun, and dropped back from the slipstream, Despite this, he was able to still finish 4th on the road and took 3rd overall on aggregate. Most competitors then made the trip to Austria for the race at Langenlebarn the following weekend, with several of the contemporary Formula 1 drivers making the trip overnight with the race being held the following day from the British Grand Prix. Courage qualified mid-pack and finished 9th at the conclusion of the 50 lap race. Next was to Spain for the first race at the new Jarama circuit near Madrid. Courage qualified M4A/2 on the fifth row and raced to 8th position at the finish. The following weekend, M4A/2 was present at Zandvoort for Courage, forming the next round of the European Championship. Run with a qualifying heat and a final, Courage finished 5th in the heat nursing a puncture, to line up in that position for the start of the final. Courage made a strong start and passed championship rival Frank Gardner to take 2nd mid race. He held 2nd to the finish, taking his best European result with M4A/2. Courage left the Dutch meeting in 3rd place in the championship, just two points behind first placed Ickx. At the near oval shape Pergusa circuit in Italy in late August, Courage qualified M4A/2 on the third row, although dropped out of the running mid-way through the first heat and retired from the overall classification with engine maladies. It was at the end of August Guards Trophy meeting at Brands Hatch that the first of the customer, production, McLaren M4As raced. In total, over 15 examples of the successful model would be made, with many of them running in Formula 2 during the following season. At Brands Hatch, Courage qualified M4A/2 on the front row for his heat, splitting Graham Hill and John Surtees. He finished 3rd in the heat and lined up on the 5th row for the final. In the main race, Courage was running very well ahead of Ickx in third, but missed a gear and went straight on, crashing out of the race and through a Courage Breweries advertising banner! It is reported that the car suffered a noticeable amount of damage, and that the monocoque was then changed before Courage was back out on track in M4A/2. They were entered for the Oulton Park Gold Cup in September, although the report lists the car as not being ready in time. For the next round at Albi in September, Courage was present with the repaired M4A/2, qualifying on the fifth row and finishing 10th after 70 laps. The 1967 season finale was at Vallelunga in October. Courage qualified reasonably, but retired from the first heat with engine trouble in M4A/2. At the conclusion of the 1967 European F2 Championship, Courage was classified 4th overall after the season campaigning M4A/2. Courage then came to an arrangement with Coombs to buy M4A/2, with the intention of doing the Tasman Series over the following winter. The car was painted maroon with gold detail and Courage picked up sponsorship from Saccone Gin for the trip Down Under. The help of Australian mechanic Les Shepherd was enlisted, and the series started at Pukekohe for the New Zealand Grand Prix in early January. Mixed with the reduced capacity, 2.5-litre Formula 1 based cars, the M4A performed very well and Courage took 3rd behind Chris Amon’s Ferrari and Frank Gardner. The second round of the four New Zealand rounds was held at Levin, where Courage went one better taking 2nd behind Amon. Jim Clark took victory in the third round at Wigram in his Lotus 49, with Courage finishing 4th in M4A/2. The final New Zealand round was held at Teretonga, victory went this time to Bruce McLaren at the wheel of a BRM, while Courage finished 5th. As February began, the teams journeyed to Australia for round five at Surfers Paradise. Courage and the M4A performed strongly yet again, taking 3rd behind winner Clark. Next was to Warwick Farm the following weekend, and Courage netted 3rd once more, the smaller capacity M4A heading many more powerful machines. The Australian Grand Prix was held at Sandown, and Courage took 5th while Clark won in his Lotus 49. The final round of the series was at Longford for the South Pacific Trophy, and it would prove to be Courage’s greatest triumph in M4A/2. After a mishap on oil in the preliminary race, Courage’s M4A/2 sported a black tape repair to the front of the bodywork for the main race. The weather changed dramatically, and support races were cancelled because of the standing water. It was deemed safe to run the main event, and Clark led the pack away from the delayed start. On the second lap, Courage took 8 seconds out of Clark as he settled into the poor conditions. On the 4th lap, he had passed Rodriguez’s BRM and Clark’s Lotus to lead by 2 seconds in M4A/2. By the end of lap 5, he had extended the lead to 11 seconds and kept going at that pace while the competition struggled behind. After 15 laps, Courage took victory and fastest lap with an enormous margin, a fraction under 1 minute, ahead of Rodriguez, Gardner, Attwood, Clark, Hill and Amon. The victory was met with great excitement from the crowd, and Courage took 3rd place in the Tasman Series standings after a very successful campaign. Courage then sold M4A/2 to Australian Niel Allen at the conclusion of the Tasman Series, who then commenced his own racing programme. Initially sporting white bodywork over the maroon monocoque, Allen took two 2nd places in his debut at Lakeside on 31st March 1968. It wasn’t long before he won in M4A/2 either, the first victory coming at Warwick Farm in May. At Lakeside in July, Allen left the track and proceeded to have an accident, requiring repair. The rebuild was completed under the watch of his chief engineer Peter Molloy, and M4A/2 was back on track with Allen in October at Surfers Paradise, where it won. At Bathurst in early 1969, M4A/2 sported twin high wings and was painted in blue, and it continued in this format with Allen through to the end of 1969. Allen’s success went on, he was classified 4th in the CAMS Gold Star rankings, and had set records at Warwick Farm. 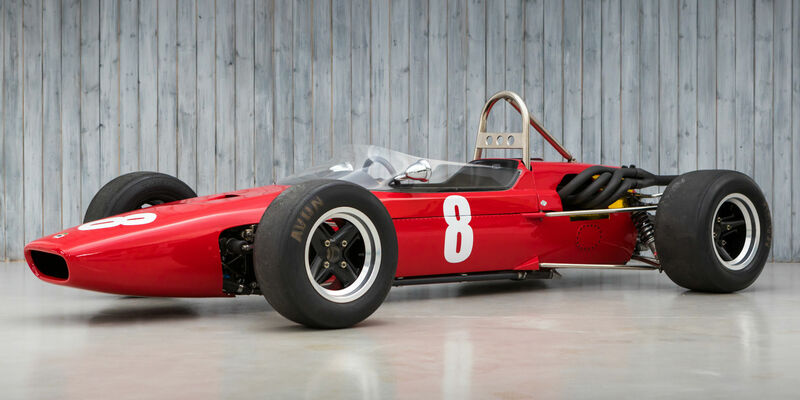 Over the winter preceding the 1970 season, M4A/2 was bought by Len Goodwin. Goodwin debuted the car at Symmons Plains in March 1970, finishing 5th, and continued to race it through 1970 until he sold it to Pat Burke. Burke ran M4A/2 for driver Warwick Brown, sporting a black with orange livery. Having competed in the 1969, 1970 and 1971 Australian GPs, M4A/2 then briefly went into Errol Richardson’s hands in 1973, before going back to Pat Burke as part of his private ‘Modena Collection’ around 1982. Burke had M4A/2 restored by Molloy to return it to its former glory. When the collection was disbanded, M4A/2 went to auction with Brooks, first in 1989 when it sold for £93,500 back to Australia. M4A/2 was then present at their 1991 Monaco sale where it sold to Dutch racer and collector Hans Hugenholtz for 555,000 Francs. After having it prepared for historic racing, Hugenholtz found that he could not fit in it and sold it to David Coplowe, England, in 1993. Hugenholtz later recalled how M4A/2 was one of the most important racing cars that he had owned. On returning to England, M4A/2 was then raced by Coplowe in historics for several years. While in his ownership, M4A/2 was maintained by Lenham Racing and later Martin Stretton Racing, and often raced in the HSCC’s Classic Racing Car championship. In 2012, M4A/2 was bought by Gareth Williams who had work undertaken on the car in his ownership by Mike O’Brien of Speedsport Promotions. In 2016, M4A/2 was bought by the current owner, who has continued to have the car maintained by Speedsport. The Cosworth FVA engine was rebuilt by Geoff Richardson in January 2017, and the fuel bag tanks were replaced with new Advanced Fuel Systems units at the same time. The current owner has enjoyed M4A/2 on select occasions, and also entered it with Michael O’Brien at HSCC Cadwell Park in 2017, where it won in fine style. The FIA HTPs were renewed and completed in 2018, and old versions are within the file along with a wide array of photographs and race reports. M4A/2 is presented today in very much up-together condition having been professionally maintained, and having shown itself to be a race winner in the HSCC Classic Racing Car series. 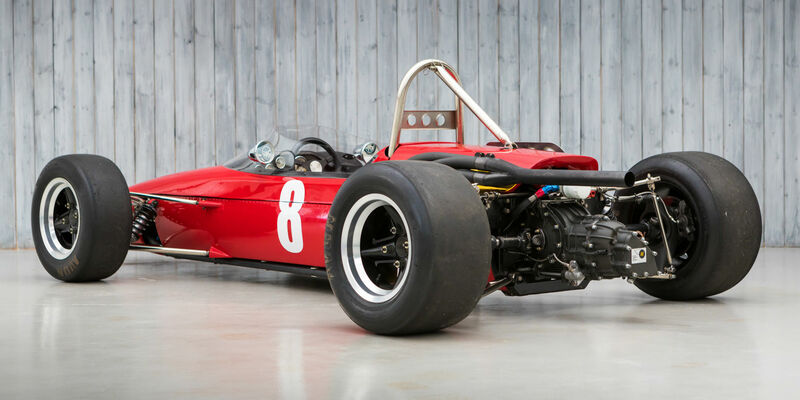 It also benefits from being eminently eligible for the Historic Formula 2 International Series where, in the Jim Clark class, it can race across Europe at legendary circuits such as Hockenheim, Magny-Cours, and Dijon along with the Silverstone Classic this coming July. The car in which Piers Courage claimed arguably his finest result, having been previously owned by John Coombs and run by McLaren long before the customer cars became available, M4A/2 is historically significant and competitive in todays historic racing circles. Not out of place either as part of a collection, as shown recently on the Boulevard at the McLaren Technology Centre, where it has been celebrated amongst an enviable line-up of McLaren’s best. One of two works cars run by McLaren in 1967 for the European Formula 2 season, long before customer M4As became available. 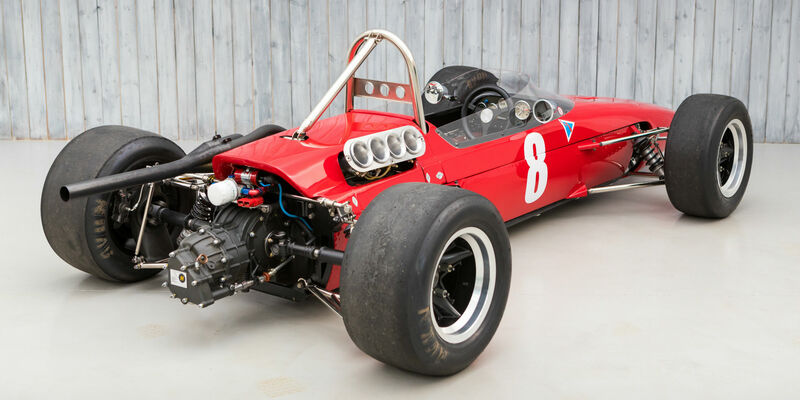 Owned by John Coombs and driven by Piers Courage while he was also a works BRM Formula 1 driver, scoring 2nd place at Zandvoort and 3rd at Hockenheim. 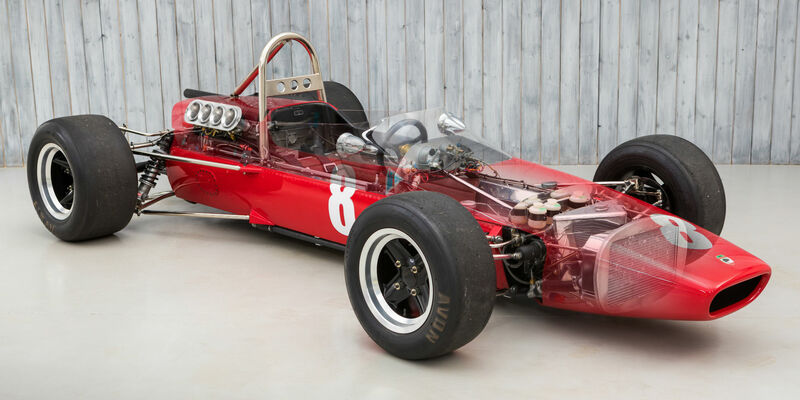 Bought by Courage in time for the 1968 Tasman Series, where he scored a phenomenal victory by a huge margin in the final round, beating the likes of Jim Clark in a Lotus 49. Courage also took a 2nd and three 3rds to finish 3rd in the series. 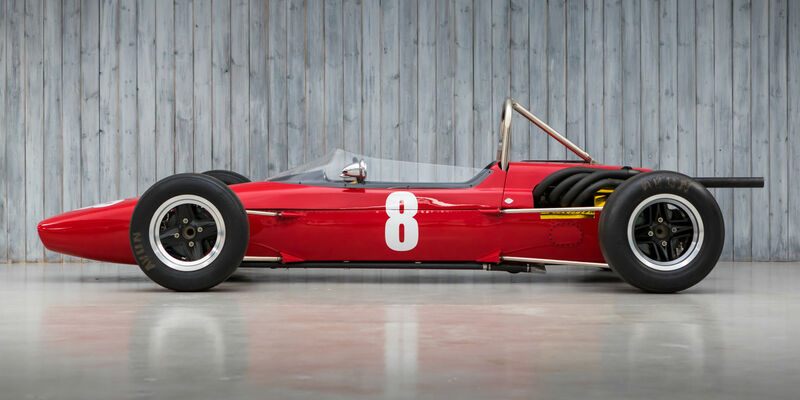 Sold to Australia at the conclusion of the Tasman Series in 1968 and raced successfully there by subsequent owners before returning to Europe in 1991. Recently maintained by Speedsport, with Michael O’Brien taking victory at Cadwell Park in HSCC Classic Racing Cars. 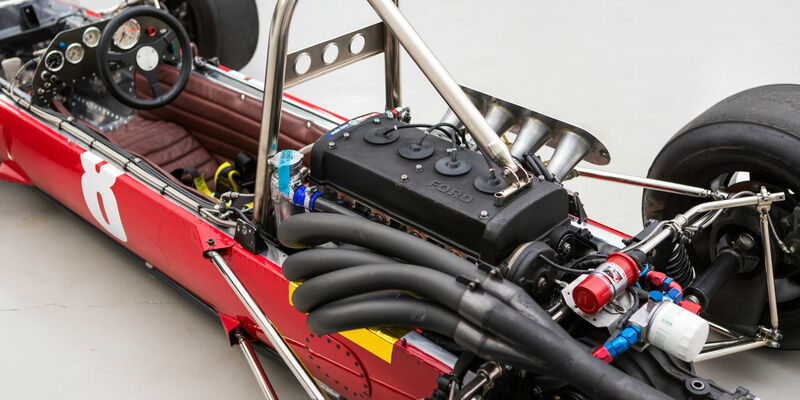 Benefitting from limited use on the Geoff Richardson built Cosworth FVA engine, 2017 fuel bag tanks and 2018 FIA HTPs. A significant and fabulous McLaren in which you can race at some of the best circuits in Europe with Historic Formula 2 and in England with HSCC Classic Racing Cars and Aurora XL, while also being the pride of any collection.